This handmade magical amulet helps bring the wearer good luck in all they desire. The combination of these semi-precious gemstones brings the wearer luck in all they desire. Nephrite Jade is the stone of all good things thru the centurines across many cultures. It has been used to bestow longevity, health and strong relationships. Black obsidian is used for protection, happiness and strength as well as dispersing negativity. 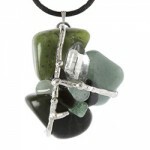 Aventurine has been known as Lady Luck as it brings good luck to the wearer. It is an all around healing stone used for many health issues. 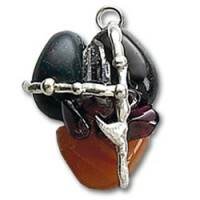 Aventuring is a power stone which aids the heart in healing and assists in finding new love. 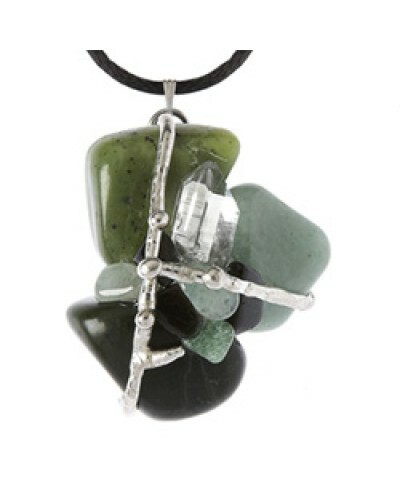 The stones are artistically combined with silver wire into a beautiful, one of a kind amulet. The gemstones in this amulet are Aventurine, Black Obsidian, and Nephrite Jade. This natural stone pendant is hand made and each is unique - please expect some variation from the image shown. Item Number: LS-AM49 | Approximate Size (Inches): 0.75 wide x 0.75 deep x 1.00 high | Approximate Shipping Weight: 0.50 lbs.